Top 10: Local(ish) buys at Manchester Christmas Market 2018. This year, we’ve gone with a British theme for our Christmas Markets round up, reflecting our growing awareness of the impact of food miles and plastics on the environment. Yes, we’ve included the odd glass of gluhwein – but otherwise,where possible, it’s a local affair. The grilled cheese specialists return to Albert Square for the third year running. Festive specials at the Albert Square and Church Street outlets include the Crimbo Dinner (turkey with all the trimmings and little pork sausage perched on top) and grilled cheese with spiced ham (What a Festive Pig £5.50). This is The Cherry Tree’s best-selling relish. They’re an outfit from the West Country and won a ‘highly commended’ award for the above chutney in 2016 from the Taste of the West awards. The stall also sell jams and homemade crackers. The best gluhwein on the market, for 50p less than you’d pay elsewhere. Its not a bargain, of course, but it doesnt feel quite as painful when you get £1 change from a fiver. For those who remember them, two fat ladies have retired and are currently holidaying in Spain. Vegan, organic and cruelty free, Buddha Beauty are multi-award-winning Manchester-based makers of hand creams, body lotions, scented candles and more. Located just by the entrance to the Square on the left if you are looking up at the Town Hall, this excellent grill serves burgers and sausages (we love the lamb burger with Stilton and Cumberland hot dog with gourmet relish) made to their own recipe in their South Cumbrian butchery and cooked while you wait. 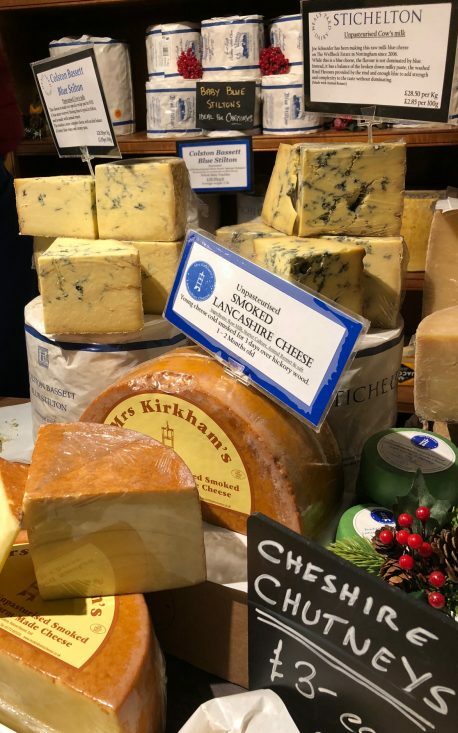 As well as selling Mrs Kirkham’s Lancashire, this exceptional cheese stall sells international award winners such as Tunworth and St James. An absolute destination for any self respecting cheese fan. Who doesn’t love cheese at Christmas – especially this one, shaped like a comedy bomb out of Inspector Gadget. It packs a fittingly powerful punch in the flavour department too. Based in Aviemore in the Highlands, the Kilted Fudge Company specialises in fudge and it’s crumbly cousin known as ‘tablet’. Choose from whiskey, Irish cream or vanilla flavours of this Scottish delicacy. Is there a more reasonably priced sourdough loaf in town? This regionally-based chain of 28 bakeries also sells scones, giant Eccles cakes and freshly baked focaccia. These salty treats come with salad, mint yoghurt and pomegranate seeds. There’s also pulled BBQ jackfruit on pitta, and other delights inspired by Europe’s sunniest climate. For more markets in Manchester click here.